On the north side of Tempelhofer Feld, an airport-turned-park in southern Berlin, lays a large ditch. Surrounded by lots and bungalows and noticeable only to those in the know, this 19th century basin holds rainwater drained from the airport’s defunct runways before it is fed into Berlin’s canal network. “We knew it was kind of a secret spot in the center of the city that nobody had on the map,” explains Benjamin Foerster-Baldenius of Raumlabor Architects. That is, until this summer. 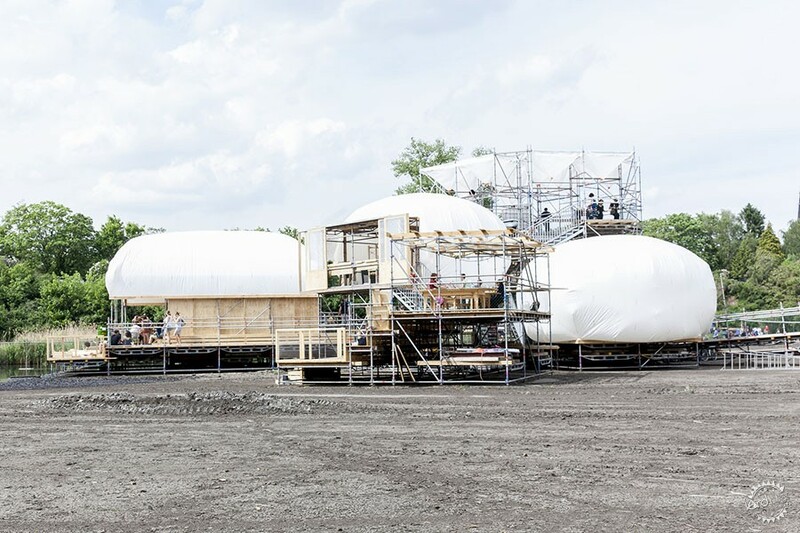 From April through September, the basin was occupied by a peculiar, offshore structure—a constellation of scaffolded volumes and floating platforms with inflatable rooftops and a large wheel. It was part-pirate ship and part-Princeton; part-Archigram and part-Burning Man. This was the Floating University, the brainchild of Foerster-Baldenius and Raumlabor, and the locus of a flurry of events—architectural, educational, and otherwise—that hopped aboard the floating structure. Funded by the German Federal Cultural Foundation as part of its ongoing Bauhaus centenary celebrations, the university was initiated by Raumlabor as a continuation and expansion on its previous education experiments such as the Urban School Ruhr, Hotel Shabbyshabby, and Making Futures at the recent Istanbul Design Biennial. In these cases, Raumlabor has taken its playful and process-focused approach to architecture and urban planning to broaden the often-rigid or exclusionary nature of education. 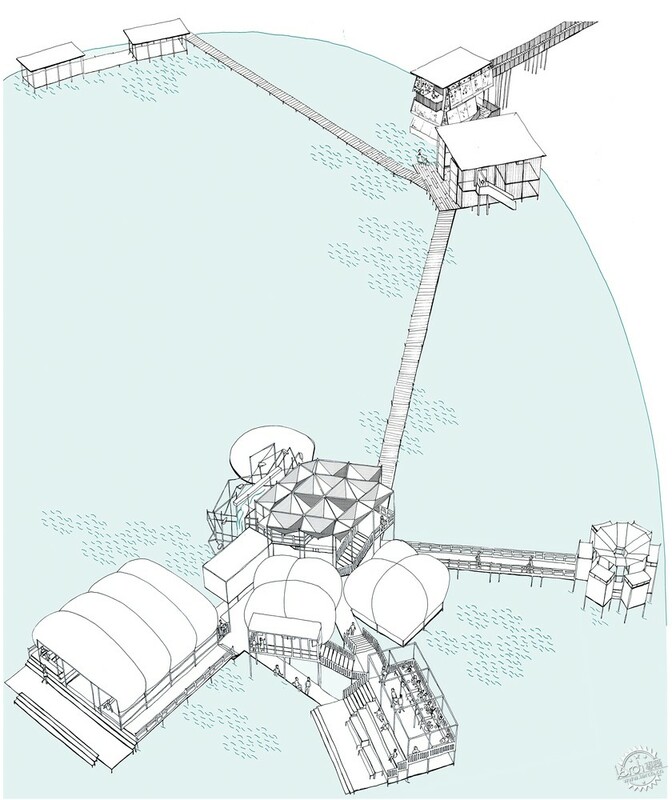 This public-facing approach gave the Floating University its architectural form and a truly unique series of spaces. From a dusty side road, a small gate led visitors onto a metal staircase with a balcony overlooking the basin, giving a dramatic first glimpse of the university structure. Through a thicket of tomato and potato planters, a waterside walkway led to the center of the structure. Here, a 100-seat auditorium (with a separate floating floor) sat beneath an inflated tarpaulin roof. Elsewhere, a modular kitchen was designed by architecture students and other participants of a workshop on the socio-spatial history of the kitchen. An innovative water filtration system, designed by artist-in-residence Katherine Bell, used a wheel to draw the ditch water through a series of interconnected bathtubs containing biological filters such as sand-biofilm, mushroom mycelium, and zebra mussels. Located at the back of the auditorium, the manual operation of the wheel took place every hour, creating a constant reminder of the bizarre surroundings. The transparency of the workings of the structure and its semi-natural surroundings were a central part of the experimental education taking place on the site: “It’s really hard to stay serious because there’s this nature theater around you, which is just so funny,” says Foerster-Baldenius. 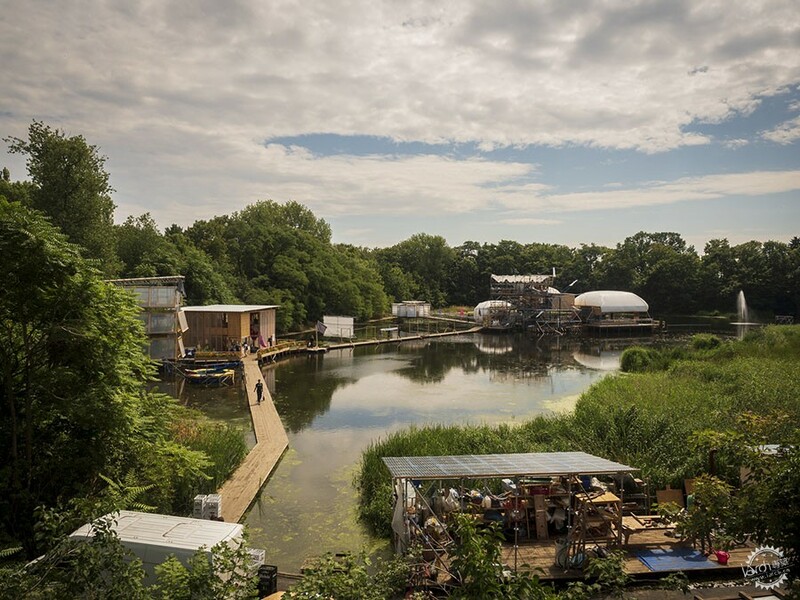 Over the summer, 25 affiliated universities—hailing from Bogotá to Paris—plugged into the structure for experimental seminars and workshops, while a parallel public program drew Berliners and visitors into discussions spanning urbanism, experimental sound art, water consumption, and the legacy of the Bauhaus. On a given Saturday afternoon one might find kids stomping around in the swamp (boots provided) while attendees joined a performance circling the ditch, enjoyed drinks at the bar, served lunch, got a haircut, listened to a lecture by Forensic Architecture’s Eyal Weizman—all at once, and while out-of-towners toured the site. Despite the resounding success of the university in expanding design education and opening public infrastructure to new uses, the project’s funding ran out and the deconstruction of the university begun in September. This is not, however, the end of the story. Over the course of its existence the project gained interest and support from city politicians, local media and, thanks to a final Floating Symposium (that ended, of course, on the floating dance floor) to discuss the future of the structure, plans are underway for it to float again in 2019.